Rear Subframe Bushing Set, Poly 95A for BMW E46 (323, 325, 328, 330, M3), Z4. The stock rubber subframe bushings deflect as torque moves through the drivetrain, which allows the entire rear end to move. 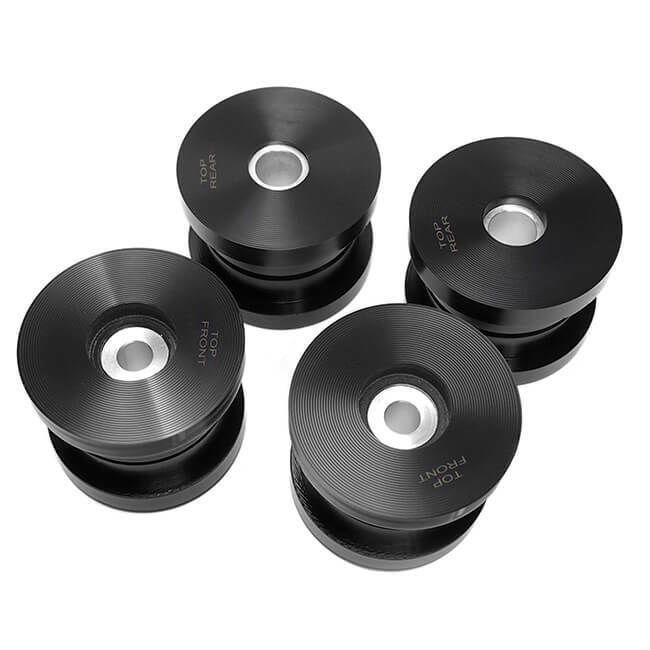 Upgrading your stock subframe bushings to our poly 95A subframe bushings will greatly reduce subframe movement for improved power transfer to the rear wheels. It is also the first step in maintaining proper rear-end geometry and alignment. The material used for the subframe bushing location(s) should match the material used for the diff mount bushing(s). These medium-hard 95A durometer polyurethane subframe bushings are our performance-spec compound bushings (as opposed to our race-spec 75D compound). They are designed for those who want a noticeable increase in performance out of their vehicle, but would still like to retain as much of a comfortable ride as possible (such as with a daily driver). Made of our exclusive U.S. Military Spec polyurethane (95A hardness) with aluminum sleeves. Set of four subframe bushings. Engineered for a perfect fit. Read why our polyurethane bushings are the highest quality bushings available.